"Grace is a contagious force we all crave and Maria contains so much grace it floods you from just a short time with her. May these pages overwhelm you with God’s love, and hope that Maria knows so well." Maria Goff has made a career out of loving her family, serving her neighbors, and turning houses into homes. She is married to Bob Goff, whom she calls the most helpful and interesting man in the world. They’ve journeyed to Uganda, Nepal, and Northern Iraq to start schools for marginalized kids. They have three adult kids, who are starting families of their own. She lives in San Diego where she and Bob continue to dream about fun and adventures yet to be had with their growing family. "I’ve had the chance to visit many places over the years. Finding the purpose behind the places I go always intrigues me. I’ve been to Maria’s home and I know it’s purpose. It’s simply a place where love lives. You’re going to enjoy reading a little more in these pages about how we can each make the places where we live, places where love lives too." "Maria and her words are a gift to every one searching for love, meaning and a place to belong. My life is brighter and my heart is bigger because of what I experienced on these pages. I cried. I smiled. I felt loved. It's an absolutely incredible book!" "Through every page, I loved discovering the powerful, mighty woman who's gentle voice and warm heart belies her strength. Maria opens the door of her heart to reveal life is found in rubble, in broken dreams, in oozing hot lava, and--most importantly--love is found in the places we least expect it. With every chapter I felt like welcomed into her home, invited to sit, and pull up a chair to listen to how to love, live, and act towards others. Not only did I walk away wanting a friend like Maria, I wanted to grow up and BE Maria Goff." "This book is the hug you didn't know you've always needed. Maria's words of hope, purpose and vulnerability ring true in the deepest parts of my soul, inspiring me to live and love better." "Maria has cultivated a beautiful heart and home where the Lord dwells richly. 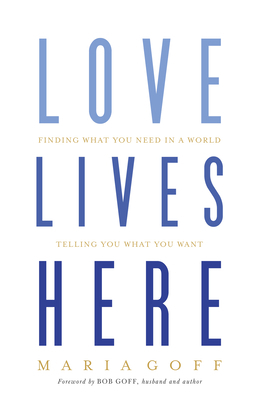 Love Lives Here shows us how we can experience amazing joy from the inside out. This book will change you and your family." "Maria Goff is the wise, gracious, and witty mentor you always wanted. With hospitality and vulnerability, she invites you to sit in the coziest chair of her home, warm cup in hand, as she tells you her stories. And in the telling, you hear anew your own stories and God's stories too."